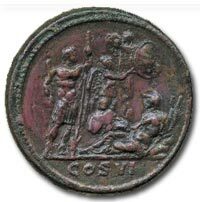 Coin Collecting Reviews – The Commodus Medallion. Obverse … Commodus (AD 177-192), AE Medallion, AD 190-191, M COMMODVS ANTONINVS PIVS FELIX AVG BRIT, laureate and bearded bust of Commodus right, wearing paludamentum and cuirass, border of dots, rev COS VI (in exergue). Reverse … Commodus standing right, wearing paludamentum and cuirass, holding parazonium and leaning on spear. Before him, Africa reclining left, wearing peplum and elephants skin head-dress, placing her right hand on the back of a lion and holding corn-ears; in background. Victory standing right, erecting a trophy. Gnecchi 5, pl.78, 5; cf BMC 29, pl.XXXIII, fig 3; Cohen 69. Some smoothing in fields, rather more extensive on the reverse, red-brown patina, good very fine and very rare. Reverse. crowned shield of arms (S.3227A; ESC.447A; W&R.46) ex Platt Hall Collection. 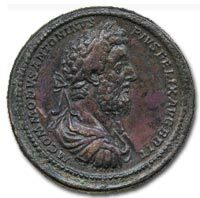 Auction estimate Sept. 2009 for the Commodus Medallion – ?18,000 to ?22,000 (GBP). Commodus was a Roman Emperor who ruled from 180 to 192. He was born as Lucius Aurelius Commodus in Lanuvium, near Rome, the son of the reigning emperor, Marcus Aurelius and first cousin Faustina the Younger. He had an elder twin brother, Titus Aurelius Fulvus Antoninus, who died in 165. On 12 Oct 166, Commodus was made Caesar together with his younger brother, Marcus Annius Verus; the latter died in 169, having failed to recover from an operation, which left Commodus as Marcus Aurelius’s sole surviving son. He was looked after by his father’s physician, Galen, in order to keep him healthy and alive and Commodus received extensive tuition at the hands of what Marcus Aurelius called "an abundance of good masters". The focus of Commodus’s education appears to have been intellectual, possibly at the expense of military training.